Our objective was to estimate the effect of various childbirth care packages on neonatal mortality due to intrapartum-related events (“birth asphyxia”) in term babies for use in the Lives Saved Tool (LiST). We conducted a systematic literature review to identify studies or reviews of childbirth care packages as defined by United Nations norms (basic and comprehensive emergency obstetric care, skilled care at birth). We also reviewed Traditional Birth Attendant (TBA) training. Data were abstracted into standard tables and quality assessed by adapted GRADE criteria. For interventions with low quality evidence, but strong GRADE recommendation for implementation, an expert Delphi consensus process was conducted to estimate cause-specific mortality effects. 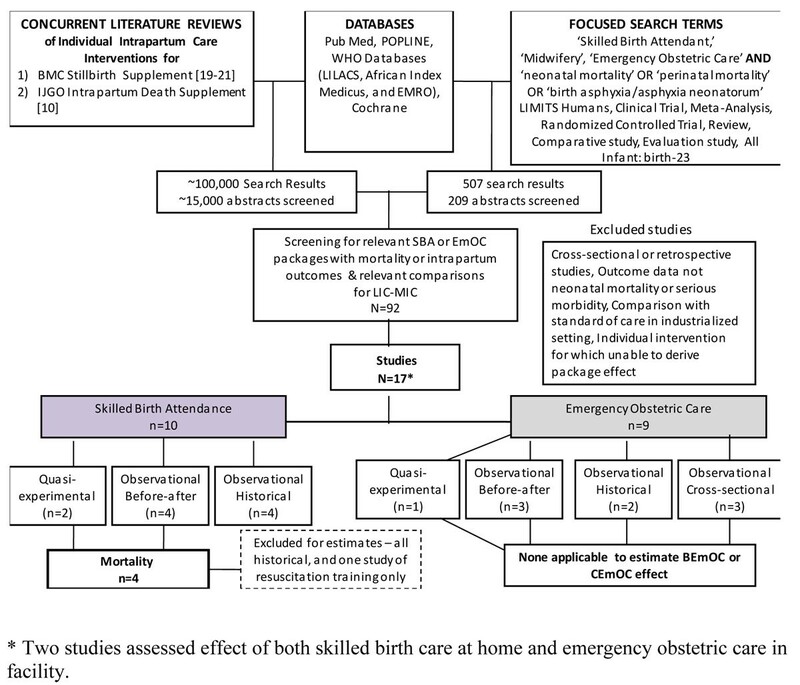 We identified evidence for the effect on perinatal/neonatal mortality of emergency obstetric care packages: 9 studies (8 observational, 1 quasi-experimental), and for skilled childbirth care: 10 studies (8 observational, 2 quasi-experimental). Studies were of low quality, but the GRADE recommendation for implementation is strong. Our Delphi process included 21 experts representing all WHO regions and achieved consensus on the reduction of intrapartum-related neonatal deaths by comprehensive emergency obstetric care (85%), basic emergency obstetric care (40%), and skilled birth care (25%). For TBA training we identified 2 meta-analyses and 9 studies reporting mortality effects (3 cRCT, 1 quasi-experimental, 5 observational). There was substantial between-study heterogeneity and the overall quality of evidence was low. Because the GRADE recommendation for TBA training is conditional on the context and region, the effect was not estimated through a Delphi or included in the LiST tool. Evidence quality is rated low, partly because of challenges in undertaking RCTs for obstetric interventions, which are considered standard of care. Additional challenges for evidence interpretation include varying definitions of obstetric packages and inconsistent measurement of mortality outcomes. Thus, the LiST effect estimates for skilled birth and emergency obstetric care were based on expert opinion. Using LiST modelling, universal coverage of comprehensive obstetric care could avert 591,000 intrapartum-related neonatal deaths each year. Investment in childbirth care packages should be a priority and accompanied by implementation research and further evaluation of intervention impact and cost. This work was supported by the Bill and Melinda Gates Foundation through a grant to the US Fund for UNICEF, and to Saving Newborn Lives Save the Children, through Save the Children US. The remarkable decline in neonatal mortality rates in the middle of the 20th century in high income countries has been commonly credited to the advent of hygienic childbirth practices and modern obstetric care , with additional reductions since the 1970s attributed to increasingly intensive neonatal care. In low income countries, where skilled professionals attend fewer than half of deliveries, and each year 60 million births occur outside facilities , the burden of neonatal morbidity and mortality related to childbirth remains very high . Intrapartum-related events in term babies associated with hypoxic injury (previously loosely termed “birth asphyxia”) are responsible for an estimated 814,000 neonatal deaths  and also one million stillbirths  each year, with perhaps one million disabled survivors with long-term neuro-developmental injury, including cerebral palsy, mental retardation, blindness, long term intellectual impairment and behavioral problems [6, 7]. Childbirth is also the time of greatest risk for maternal deaths with at least 42% of the annual estimated 352,000 maternal deaths occurring during labor and the first 2 days after birth [3, 8, 9]. While skilled attendance at delivery and emergency obstetric care are the basis of modern obstetrics, there is remarkably limited impact evaluation. This gap is related both to methodological challenges such as the large sample sizes required for meaningful statistical comparisons, and also because many obstetric interventions were in routine practice before the advent of randomized controlled trials (RCTs), making it unethical, for example, to undertake a RCT of the impact of Caesarean section . Estimates of the effectiveness of intrapartum care in reducing maternal and neonatal mortality and stillbirths are needed to inform healthcare planning and prioritization in low resource countries. In this paper, we assess the evidence for effect on neonatal mortality of health service delivery packages during labor and childbirth. The terminology around childbirth care has been through various transitions in the last decade, and at times even different United Nations (UN) agencies use the same term differently . Here, we have taken the latest UN consensus and reviewed the terminology for clarity (Table 1). Comprehensive emergency obstetric care ( CEmOC ) is the standard full package of obstetric care including Caesarean section and blood transfusion [12, 13]. Basic emergency obstetric care ( BEmOC ) includes the six signal functions that should be available at first-level facilities which provide childbirth care: parenteral antibiotics, parenteral oxytoxics, parenteral anticonvulsants for pre-eclampsia or eclampsia, assisted vaginal delivery (including vacuum or forceps assistance for delivery, episiotomy, advanced skills for manual delivery of shoulder dystocia, skilled vaginal delivery of the breech infant), manual removal of the placenta, and removal of retained products [12–14]. Skilled childbirth care is defined by WHO as care provided by “an accredited health professional – such as a midwife, doctor or nurse – who has been educated and trained to proficiency in the skills needed to manage normal (uncomplicated) pregnancies, childbirth and the immediate postnatal period, and in the identification, management and referral of complications in women and newborns.” [12, 13] For the purpose of these estimates, the effect of skilled attendance is considered as the attendant without additional obstetric care functions (BEmOC or CEmOC). We also reviewed the evidence for childbirth care by community cadres providing care at birth, such as a Traditional Birth Attendant ( TBA ), defined by WHO as a person who “assists the mother during childbirth and who initially acquired her skills by delivering babies herself or though an apprenticeship to other TBAs” . Traditional birth attendant defined by WHO as “a person who assists the mother during childbirth and who initially acquired her skilled by delivering babies herself or through an apprenticeship to other TBAs”. A “trained TBA” is “any TBA who has received a short course of training through the modern health sector to upgrade her skills” . TBAs may range from family members attending only occasional births to women with considerable expertise attending 20+ births/year. TBAs are not usually salaried, and typically not civil servants or employed by Ministry of Health. These packages include care provided during labor and birth, but in order to be effective, the care may have been initiated during the antenatal period (e.g., screening for abnormal lie and decision for elective Caesarean section, or screening and management of hypertensive disease of pregnancy/eclampsia). Some interventions are primarily intrapartum in timing such as management of acute intrapartum events including antepartum hemorrhage, cord prolapse and obstructed labor. - Postnatal healthy practices (breastfeeding, hygienic cord and skin care, thermal care). - Antibiotics for preterm premature rupture of membranes (affects deaths from infections). Emergency obstetric care coverage remains extremely low, especially in rural areas: only 5% of births in rural South Asia and 1% in rural Sub-Saharan Africa are by Caesarean section . Ensuring equitable coverage of skilled attendance may have been under resourced because it is considered complex and expensive . If the impact of more complex childbirth care is high, then even given higher cost, the cost-effectiveness ratio may still be very favorable. There is a critical need for data regarding lives saved in order to inform investment choices and design effective programs. Skilled attendance coverage in Sub-Saharan Africa has increased little in the last decade. The Lives Saved Tool (LiST) has been designed to enable national (or sub-national) planning based on estimation of lives saved for mothers, neonates and children (http://www.jhsph.edu/dept/ih/IIP/list/index.html). The tool comes with a menu of interventions that are linked to mortality effects, and the user can increase coverage of each intervention from a baseline rate to compare the impact and cost of different interventions at varying levels of coverage. The objective of this review is to estimate the effect of different packages of care during labor and birth on intrapartum-related neonatal deaths in term babies, for inclusion in the Lives Saved Tool (LiST). We followed a standard approach to searches, abstraction and evaluation of evidence as set out by the Child Health Epidemiology Group (CHERG) for effect estimates to be used in the LiST model . More details of the review methods, the adaptation of GRADE, the rules for attribution of mortality effect, and the LiST model, are published elsewhere [17, 18]. We undertook systematic searches of published literature from 1980 until March 2010. The original search was part of two parallel comprehensive literature reviews assessing the impact of intrapartum childbirth care on stillbirth [19–21] and intrapartum-related neonatal mortality . The following databases were searched without language restrictions until March 2009: PubMed, POPLINE, Cochrane, EMRO, LILACS, and AIM (figures 1, 2). The search terms included MESH combinations of “skilled birth attendant,” “midwifery,” “basic/comprehensive emergency obstetric care,” “traditional birth attendant,” AND “birth asphyxia,” “asphyxia neonatorum,” or “neonatal-perinatal mortality.” A second updated search was conducted in March 2010 that required “skilled birth attendant,” “midwifery,” “emergency obstetric care,” “traditional birth attendant” AND “neonatal OR perinatal mortality.” Snowball searching, whereby literature referenced in key papers was included, was also employed. Data from studies meeting the inclusion criteria were extracted using a standard form (Additional File 1). We assessed the quality of each study using a standard approach developed by the Child Health Epidemiology Reference Group (CHERG) . We applied the PICO format (Patient, Intervention, Comparison, and Outcome) to define the studies to be included as follows. The population of interest was pregnant women, or those in labor. The interventions considered are childbirth care packages and TBA training, as defined in Table 1. The study intervention was considered to meet package criteria  if 1) the authors directly described the intervention using package terminology (eg. BEmOC or CEmOC), or 2) the majority of package functions were reported to have been provided. The effects of other interventions around childbirth are considered in separate reviews. While specific interventions, such as clean delivery practices and neonatal resuscitation, are considered essential elements of skilled birth attendance and emergency obstetric care, the effects are estimated separately in the LiST tool and reviewed in other papers [23, 24] . The effects of individual childbirth interventions (such as fetal monitoring, partograph, labor induction, or Caesarean section), were reviewed separately in two concurrent supplement reviews published elsewhere and are not detailed again here [10, 20, 21]. In addition, those interventions specifically targeting the prevention of deaths due to preterm complications, even if provided during the intrapartum period, are not considered here, such as corticosteroids for prevention of preterm labor and antibiotics for preterm PROM) [25, 26]. In LiST the counterfactual is no care at all. Clearly a randomised trial with no skilled care provided at birth would be considered unethical, and most evaluations are non-randomised where the comparison is with standard practice. Hence we included studies with other comparison groups, such as before/after studies of improvements to existing services, cross-sectional and case-control studies, and historical data that reported mortality impact over several decades, recognizing that the majority of these studies did not control for confounders and were thus potentially subject to substantial bias. A neonatal death was defined as a death in the first 28 days of life, early neonatal death as death in the first 7 days of life, and perinatal death as a stillbirth (>1000 gms, > 28 weeks gestation) or death in the first 7 days of life. Deaths due to any cause are referred to as all cause mortality and intrapartum-related neonatal death classifies babies who die from childbirth related hypoxic events, (ie. what was previously referred to as “birth asphyxia”). While the term “birth asphyxia” has been used to describe babies who do not breathe at birth, the term is no longer recommended for epidemiological use in cause-of-death attribution [5, 27]. Intrapartum-related neonatal mortality is defined by CHERG, based on ICD 10 rules and recent global consensus statements, as term babies who die after neonatal encephalopathy, or death prior to onset of neonatal encephalopathy, with evidence of intrapartum injury or acute intrapartum events [5, 27]. 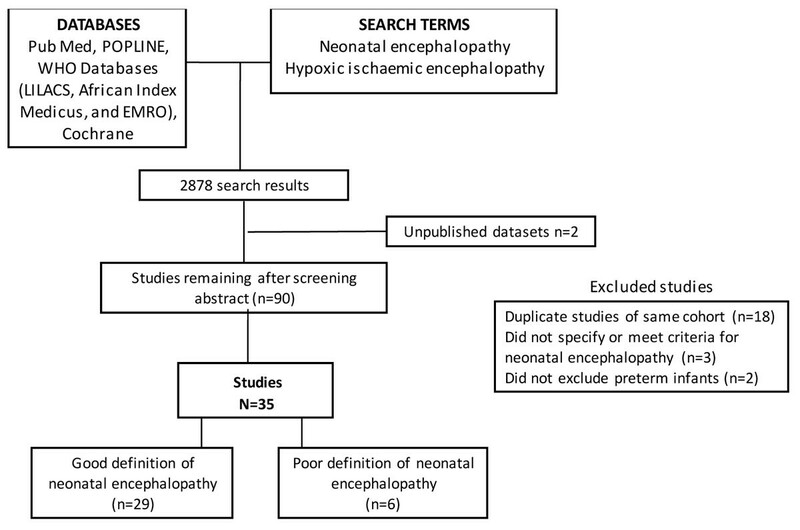 Neonatal encephalopathy (NE) may directly result from intrapartum hypoxia and is considered a predictive marker of long term morbidity and mortality . NE is defined as a “disturbance of neurological function in the earliest days of life in the term infant manifested by difficulty initiating and maintaining respiration, depression of tone and reflexes, abnormal level of consciousness and often by seizures [28, 29].” Hypoxic Ischemic Encephalopathy is the condition of neonatal encephalopathy following severe hypoxic injury, however, is not recommended unless there is clear evidence of sufficient hypoxemia to account for impaired brain function . We also examined studies that reported all cause neonatal mortality or specific morbidity, notably NE. We did not examine Apgar score as an outcome since our goal was to establish mortality effect estimates and the Apgar score is considered to be an unreliable indicator of mortality . The effects of intrapartum care on stillbirths and maternal outcomes are also important and are reviewed elsewhere in this supplement . Given the paucity of direct evidence of package impact, we also conducted an ecological analysis to examine the relationship between NE incidence and coverage of childbirth care, drawing on a systematic review for the Global Burden of Disease Project, undertaken with the Child Health Epidemiology Reference Group . 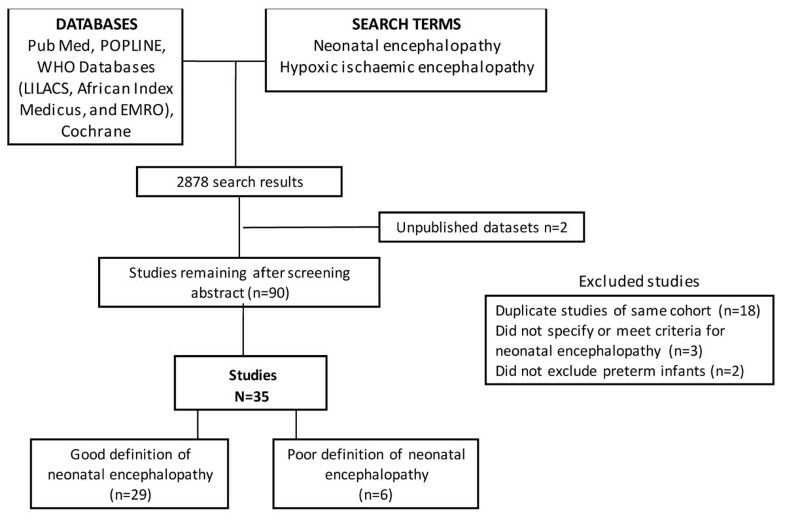 In brief, PubMed, POPLINE, Cochrane, EMRO, EMBASE, LILACS, and AIM databases were searched using the terms “neonatal encephalopathy” and “hypoxic ischemic/ischemic encephalopathy” (figure 3). All titles were reviewed and articles were retrieved that had data on incidence, case fatality rates or chronic impairment. Potentially relevant country covariates, including % skilled attendance, % facility delivery, and % Caesarean section, were obtained from UN databases . The natural log of the neonatal encephalopathy incidence rate was regressed on each obstetric indicator of interest using simple linear regression. For interventions with low or very low quality evidence but strong recommendation for program implementation [34, 35], as per CHERG rules for LiST effect estimates, we sought expert consensus via the Delphi method . We invited a panel of experts in obstetrics, gynecology and newborn health from all WHO regions and including multiple disciplines - program management, research, clinical obstetrics, and general paediatrics. The questionnaire was developed by JL, ACL, NM and GLD through several rounds of pilot testing. The survey was sent by email and included the background and aims of the Delphi process, evidence identified, and requested seven different effect estimates (Additional File 2). Respondents were allowed the option of anonymous response. The median response and range were determined for each question. Consensus was defined a priori as having been achieved when the inter-quartile range of responses to a given question was < 30%. For those estimates not reaching consensus on the first round, the results were electronically distributed to the panel, virtual discussion allowed, and a second round of email questionnaires sent. We conducted meta-analyses for mortality outcomes [neonatal mortality rate (NMR), perinatal mortality rate (PNMR), and early neonatal mortality rate (ENMR)] of observational before-after studies of community-based skilled birth attendants. Studies were considered for inclusion in the meta-analysis that had comparable intervention, study design, and outcome of interest. Statistical analyses were performed using STATA 10.0. The Mantel-Haenszel pooled risk ratio (RR)—or where there was evidence of heterogeneity (p<0.05), the DerSimonian-Laird pooled RR—and 95% confidence interval (CI) were calculated. For the Delphi panels, expert estimates were entered in an Excel spreadsheet and simple descriptive statistics were produced. The search strategies and results are summarised in figures 1, 2. From the combined searches for skilled birth attendance and emergency obstetric care, which yielded around 15,000 abstracts, we retrieved 92 papers, reports or conference abstracts for full text review. From these, 17 studies reporting outcomes and comparisons of interest were identified. For the combined searches for traditional birth attendants, a total of around 3000 abstracts were identified, yielding 11 articles of interest. Overall, few studies presented comparisons of childbirth care packages consistent with the UN definitions (table 1). 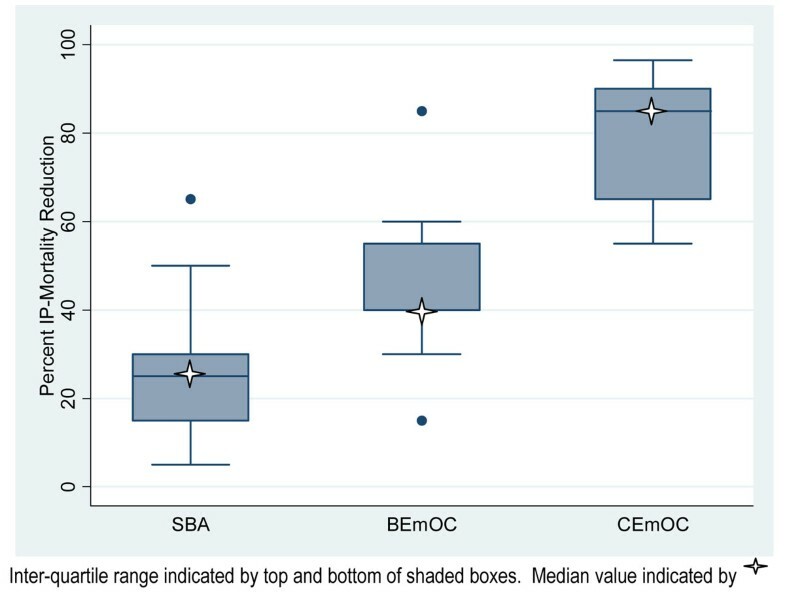 The 9 studies of emergency obstetric care packages reporting neonatal mortality outcomes identified for this review were low quality and heterogeneous in terms of intervention content (Table 2), and not suitable for meta-analysis or for the LiST mortality effect estimation. Training all maternity staff (obstetricians, neonataologists, midwives, anesthesiologists) in 2 week WHO "Effective Perinatal Care" program, including use of partogram, emergency obstetric and neonatal care (resuscitation). Opening of primary maternity facilities at polyclinic to serve low risk deliveries in the community. Pre-booking of deliveries of high risk pregnancies at Maternity hospital with CEmOC capacity. 85% home births, 15% in hospital. We identified one study that compared basic and comprehensive emergency obstetric care with no skilled care with respect to neonatal mortality outcomes . Ronsmans and colleagues analyzed health and demographic surveillance system data from 1987-2005 in Matlab, Bangladesh to examine the relationship between the use of BEmOC and CEmOC with early neonatal mortality and stillbirth . They found that women receiving BEmOC and CEmOC had a higher risk of early neonatal mortality (BEmOC aOR 1.47, 95% CI 1.27-1.69; CEmOC aOR 2.69, 95% CI 2.16-3.37) compared to mothers delivering at home without skilled care. However this observational study is prone to selection bias, as skilled care/emergency obstetric care was likely sought for higher-risk, complicated deliveries, and thus the observed association is unlikely to reflect the population effect of the intervention . The Skilled Care Initiative in Burkina Faso involved multiple activities to increase access to skilled birth care, including improving availability and quality of CEmOC by upgrading hospital capacity, equipment, and training in CEmOC at the district hospital (Table 2) [38, 39]. At the end of the intervention period the PMR was 27.5/1000 in the intervention district compared with 33/1000 in the control district (OR 0.75, 95% CI 0.70-0.80) . However, it is unclear how similar PMRs were in the intervention and control districts at the beginning of the intervention, and CEmOC was just one component of a complex intervention that also included community mobilization and education. We identified historical reports from Malaysia  and Finland  that reported NMR trends coinciding with improvements in obstetric and neonatal care. In Malaysia, over three decades (1960-1990s), a national strategy to increase skilled birth attendance was implemented which included training professional village midwives (1970-80s), establishing links with district and referral hospitals, and a gradual shift to births in facilities with capacity for basic emergency obstetric care (1985-1990s). By 1995, institutional delivery had increased to 88% and the national NMR had declined from 75.5 in 1957 to 14.8 in 1991 . In a Finnish university hospital, multiple obstetric and neonatal care improvements were instituted from 1968-1982 (including increased intrapartum monitoring, Caesarean section, corticosteroid therapy, amniotic fluid surfactant determination, and reduction in vaginal breech deliveries). Over the same time period, a 71% reduction in intrapartum-related neonatal mortality and a 61% reduction in all-cause perinatal mortality was observed. However, the effect of improved neonatal intensive care is likely to have played a major additional role in this mortality reduction. In a tertiary care hospital in the UK, following an EmOC training course (cardiotocography interpretation; emergency drills for dystocia postpartum hemorrhage, eclampsia, breech delivery, and neonatal resuscitation) for obstetricians and midwives, a 50% reduction in hypoxic ischemic encephalopathy (95% CI: 0.26-0.95) was observed . However, baseline care was likely substantially more complex than in the ‘average’ low-income country setting, and thus, this may underestimate the effect compared with no care. In addition the observed mortality reduction includes the effect of training in neonatal resuscitation, which is a separate intervention in LiST. Additional studies which provide supporting evidence of package effect are shown in Table 2, [42–45]. Our ecological analysis of the association between NE incidence and the proportion of institutional births is shown in Figure 4. The modelled incidence of neonatal encephalopathy when 10% of deliveries take place in health facilities was 18.6/1000 live births. Given a neonatal case fatality ratio of 25% using the median neonatal case fatality in high mortality level settings (NMR>15) from the literature review , the neonatal encephalopathy mortality rate would be around 4.7/1000 live births. When 90% of births take place in a facility, the modelled incidence of neonatal encephalopathy is 4.7/1000 live births (figure 4). Given a case fatality ratio of 15% , this results in a neonatal encephalopathy mortality rate of 0.7/1000 live births, which is around the reported rate for associated obstetric factors in the UK. Thus, comparing 10% facility birth and 90% facility births, there is approximately a 75% reduction in the incidence of neonatal encephalopathy and an 85% reduction in neonatal encephalopathy-related mortality. This reduction, however, assumes that facility birth equates to prompt access to emergency obstetric care, and includes the effect of neonatal resuscitation and ongoing facility-based neonatal care, both of which may not be available in many facilities in low-resource settings. Hence this effect size (85%) may be expected to be above the upper limit of the effect of comprehensive obstetric care, not including resuscitation or ongoing neonatal care. Variation of the incidence of neonatal encephalopathy (NE) with the natural log of the proportion of institutional deliveries. Legend: Each dot represents NE incidence data reported by a single study. For some countries more than one incidence was reported. 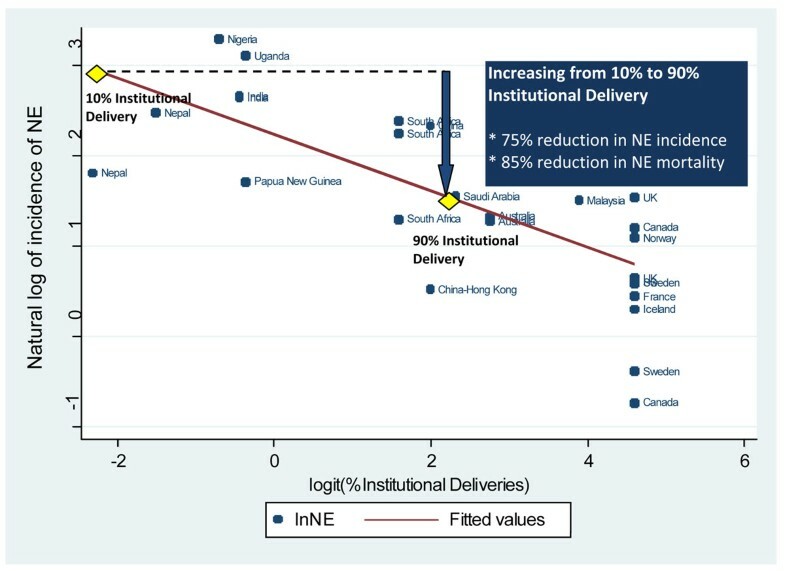 The regression line is modeled as: lnNE=2.237 – 0.311 * logit (% Institutional Delivery) R2=0.50 According to this model, when increasing from settings with very low proportion of births in facilities (10%) to settings with high proportions of facility deliveries (90%), the incidence of neonatal encephalopathy decreases by 75%. When applying case fatality rates for neonatal encephalopathy based on the respective mortality setting, mortality from neonatal encephalopathy is reduced by 85% when facility birth is increased from 10% to 90%. For a delivery attendant alone, provider training may avert hypoxic brain injury by primary prevention via early recognition and referral for childbirth complications, or by secondary prevention, via managing the non-breathing baby with essential newborn care and neonatal resuscitation. The focus of this current review is on primary prevention, as neonatal resuscitation and thermal care are reviewed separately for LiST [24, 47]. The evidence with respect to home-based skilled childbirth care has been reviewed in detail elsewhere . We identified 10 studies reporting the impact of community-based skilled birth attendants on intrapartum-related perinatal or neonatal mortality (Tables 3 and 4): 2 quasi-experimental studies, 4 before-after studies, and 4 observational historical studies. Nine studies were from low- or middle-income settings. 1829 Training of midwives in use of forceps, "sharp hooks and perforators"
Four studies met our inclusion criteria and had trained community midwives [48–51] or village doctors  in intrapartum monitoring and management, with appropriate links to the health system, including referral and or transport to BEmOC or CEmOC facilities. Additional file 1 and Table 5 shows the GRADE table of included studies and their limitations. Only one study reported the effect of training community midwives on intrapartum-related neonatal mortality (RR 0.78, 95% CI 0.64-0.95) . We undertook meta-analysis for three outcomes (figures 5, 6, 7). The before-after data was used instead of the quasi-experimental comparisons because in one study the control group had different baseline characteristics , and in the other, there was contamination of the intervention in the comparison areas . Two studies [49, 50] reported the effect on all-cause neonatal mortality (pooled effect size RR 0.82, 95% CI 0.75-0.90). 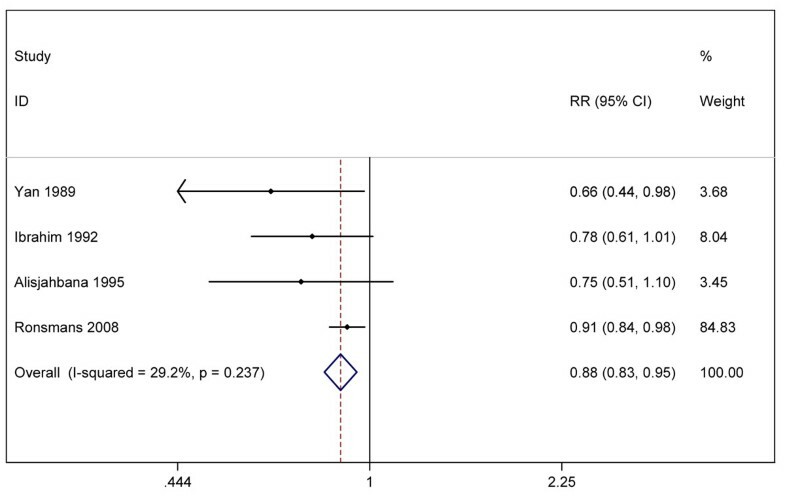 Three studies [48–50] reported the effects on early neonatal mortality (pooled effect size RR 0.87, 95% CI 0.79-0.97), which is more reflective of intrapartum-related mortality than all-cause NMR given that ~90% of “asphyxia” deaths occur in the first week of life [53, 54]. Four studies reported the effect on perinatal mortality; the pooled effect was RR 0.88 (95% CI 0.83-0.95) [48–51]. While the data appear to indicate a consistent small protective effect of skilled childbirth care and all of the studies were conducted in low-income countries, the overall quality of the evidence is low by GRADE criteria . Six studies of community midwives were excluded from these meta-analyses. Of these, four historical studies were excluded due to the very low data quality [40, 55–57] . We also excluded a study from PATH Indonesia , which was a before-after design that did not accurately determine the denominator of live births and was primarily focused on training for neonatal resuscitation. The Matthews study  was excluded as the midwives and EmOC skills training were facility-based, while the community based component involved TBA training only. The intervention reviewed is the impact of training TBAs in childbirth care, or primary prevention via early recognition and referral for obstetric emergencies, and excludes neonatal resuscitation, which is reviewed separately. The evidence for TBA training has been reviewed in detail elsewhere . We present here a summary of the main findings. We identified one review , later adapted as a Cochrane , and 9 studies of TBAs with neonatal mortality outcomes (figure 2). Of the 9 studies, 5 studies were excluded as they focused primarily on neonatal resuscitation training versus primary prevention leaving 1 cluster RCT, 2 before-after studies and 1 cross-sectional study of interest (table 6). Establishment of “mini- maternities” with telephones for TBA births. TBA training in antepartum, intrapartum, postpartum, and neonatal care; distribution of clean delivery kits; referral for emergency obstetrical care. Lady health workers also trained to support TBA and link community-health center services. Sibley and Sipe  conducted a meta-analysis in 2004 of 17 studies (n=15 286 in treatment vs 12 786 in control) and reported a 6% reduction in all-cause perinatal or neonatal deaths in the areas served by trained TBAs. TBA training was heterogeneous between studies, however, and included both primary and secondary prevention measures (neonatal resuscitation). 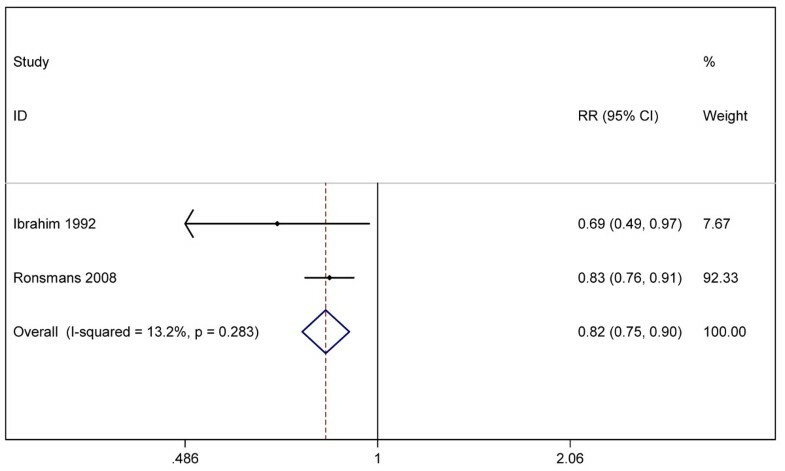 In their pooled analysis of 3 studies (n=6217 neonates in the treatment group vs 5170 controls), TBA training was associated with an 11% reduction in “birth asphyxia” mortality, though this effect estimate also captures the effect of TBA training in neonatal resuscitation as it included 3 sites with TBA resuscitation (the SEARCH trial during the TBA training phase , Chandigarh, India , and Ethiopia ). In a Cochrane review conducted by Sibley et al , two studies with mortality outcomes met quality inclusion criteria. A large, cluster-randomized, controlled trial (cRCT) was conducted in Sindh, Pakistan, where TBAs in intervention areas were trained to encourage care-seeking, recognize obstetric emergencies, refer for EmOC, use clean delivery kits, and promote essential newborn care . Furthermore, these TBAs were integrated into the health system by improving linkages with Lady Health Workers and community clinics. Pregnant women attended by trained TBAs were more likely to be diagnosed with obstructed labor (RR=1.26, 95% CI 1.03-1.54) and referred for EmOC (RR 1.50, 95% CI 1.19-1.90). PMR was reduced by 30% in intervention clusters (OR 0.70, 95% CI 0.60-0.80), stillbirth rate was reduced by 31% (OR 0.69, 95% CI 0.57-0.83) and NMR by 29% (OR 0.71, 95% CI 0.62-0.83). Intrapartum-related mortality was not reported; however, the concurrent reduction in both stillbirths and neonatal deaths suggests the primary prevention of intrapartum injury. The second study included in the Cochrane review was a before-after assessment of hospital-based TBA training in Guatemala . Following training, there was a 53% reduction in perinatal deaths among those women referred to the hospital for delivery (16/72 pre-training vs. 24/203 post-training). However, given that the outcomes of community-based births are unknown, it was not possible to determine the impact at the population level. 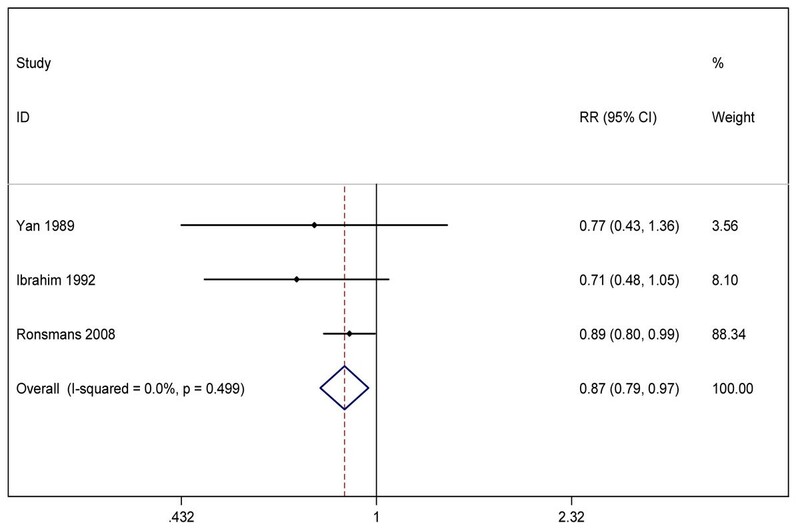 The two trials [65, 66] were not pooled in the Cochrane analysis because of differences in study design. Since the Cochrane evaluation , 3 additional trials have reported the effects of TBA training on perinatal or neonatal mortality [67, 68, 88] but these trials focused primarily on neonatal resuscitation and are assessed in the paper regarding neonatal resuscitation . The CHERG-adapted GRADE approach and Rules for Evidence Review were applied to assess the overall quality of evidence for packages of childbirth care  (tables 5, 7). The quality of evidence for BEmOC or CEmOC was very low. No studies were identified of BEmOC or CEmOC as an isolated package that were usable to estimate a cause-specific neonatal mortality or an all-cause neonatal mortality effect. Nine low-grade observational studies or historical data were identified with information relevant to the effect of emergency obstetric care packages, however, these were insufficient to derive a cause-specific mortality effect. For the effect of skilled birth attendance alone on intrapartum-related neonatal deaths, 10 studies (8 observational, 2 quasi-experimental) were identified of community skilled birth attendants and there were sufficient events meeting CHERG criteria (>50) , however, the overall quality of evidence was low, and there were limited cause-specific mortality data. Furthermore, the studies were primarily of community midwife training, and the comparison (baseline) was a setting where skilled birth attendants already provided childbirth care, and did not reflect a counterfactual without any skilled care at birth. Therefore for all three of these intervention packages, expert opinion was obtained to derive effect estimates. For TBA training, there were two previous meta-analyses including one cRCT. The overall level of evidence was low, and the GRADE recommendation was conditional given the limited, heterogeneous evidence, and that the intervention effectiveness is likely to be highly context specific [34, 35]. Therefore no Delphi process was conducted to estimate the effect of TBAs on neonatal mortality. In view of the low quality of evidence identified, a Delphi was undertaken . The expert Delphi form included relevant data from the literature review (Additional File 2). A total of 21 experts participated, with representation from South Asia, Africa, Western Europe, North America, and Latin America/Caribbean. Consensus was reached in the first round for three questions (Questions 1, 2, 5), and after the 2nd round for the remaining four questions (Questions 3, 4, 6, 7). The Delphi expert panel consensus was that skilled childbirth care alone would avert 25% (range 5-65%, IQR 15-30%) of intrapartum-related neonatal deaths compared with no skilled care (figure 8). Basic and comprehensive emergency obstetric care was estimated to avert 40% (range 15-85%, IQR 40-52.5%), and 85% (range 55-96.5%, IQR 67.5-87.5%), of neonatal deaths due to intrapartum events, respectively. Box plot of Delphi expert opinion effect on intrapartum-related neonatal deaths of: Skilled attendance alone, Basic Emergency Obstetric care and Comprehensive Emergency Obstetric Care (21 experts). There are 2 million deaths each year resulting from childbirth - 814,000 intrapartum related neonatal deaths, over 1 million intrapartum stillbirths and a significant proportion of the world’s 352,000 maternal deaths. Skilled childbirth care is recommended as a universal right to reduce these deaths, yet there is limited mortality evidence of the effect of childbirth care packages. The mismatch between the size of the problem and the quality of the useable evidence is stark. Our primary finding, and the main limitation of our review, is the lack of high or even moderate quality evidence of the effect of childbirth care on neonatal mortality, particularly in low and middle-income countries where the impact would be the greatest. There are a number of reasons for this low level of evidence including the challenges of ethical approval for RCTs testing care that is already considered standard, variations in obstetric packages evaluated, and inconsistencies in outcome measurement. The variation in terminology surrounding “birth asphyxia” is a key limitation. Consistent case definitions are required; we have used the terminology “intrapartum-related” to classify neonatal deaths due to childbirth-related complications in term infants, however despite recent improvements in clarity, many of the studies identified were older and outcome definitions varied. Furthermore, in settings where the majority of neonatal deaths occur in homes, and outside of vital registration, ascertaining cause of death must often rely on verbal autopsy, which varies with respect to tools , definitions, and hierarchies used. Consistent use of such verbal autopsy tools, and more importantly the hierarchies, is critical . Finally there is a paucity of data from resource-limited settings on intrapartum-related neonatal morbidity, such as neonatal encephalopathy, which requires regular neurologic assessment and is not possible for the majority of newborns in LMIC who are born at home. The skilled birth attendance studies which we identified were heterogeneous with varying coverage and provider skill levels, and likely underestimated the effect for several reasons. First, the results for the before-after studies reflect that of additional midwife training, since at baseline midwives were already conducting deliveries in the community and attending deliveries, so the baseline effect is not zero. In Matlab, Bangladesh, the magnitude of the effect in the intervention vs. comparison villages was diluted by the low coverage of midwives at birth (only 25%). Furthermore, in many communities, formally trained midwives are only sought for complicated deliveries where the baby is already compromised and could only have been saved by emergency obstetric care, which may not be available. Given the lack of cause-specific mortality evidence, we followed the LiST rules based on GRADE, and the effect of the 3 obstetric care packages was estimated using Delphi expert consensus . We included a variety of experts with wide geographic representation (geographic region, low-middle and high income settings) and range of expertise and background (clinical, epidemiology, obstetrics, neonatology). Consensus was reached within an IQR of 30%. However, any expert opinion process is clearly limited, and far from ideal. Nonetheless, the potential for major mortality reductions with skilled intrapartum care, particularly due to intrapartum-related neonatal deaths, is widely accepted and consistent with historical data from the UK, Finland, and Malaysia. Whilst the lack of RCT evidence for the provision or non-provision of childbirth care is understandable, given that it would be unethical to conduct such trials, the dearth of observational studies of quality improvement of childbirth care assessing its effect on neonatal mortality is disappointing and a clear priority for more research. The few significant, large intervention trials of direct relevance for establishing mortality effect estimates were those of community midwife training, EmOC training, and individual interventions to improve labor monitoring and interventions (such as use of the partograph or fetal monitoring) that are reviewed in detail in two other publication supplements [10, 20, 21]. In some studies, there were specific missed opportunities to collect relevant perinatal outcome data. The QUARITE trial, a cluster-randomized trial of quality improvement in obstetric care via emergency obstetric care training (ALARM) and maternal death reviews, is presently underway and has perinatal-neonatal mortality as a secondary outcome . This, and hopefully many more such evaluations, will help to fill a critical information gap. For the 60 million women who deliver at home world-wide, achieving universal skilled birth attendance may require decades, and in the meantime many preventable deaths occur each year, primarily at community level . TBAs attend up to 40% of births in South Asia, while the majority of home births in Africa are unattended . The evidence for TBA training programs is of low quality and heterogeneous [60, 61, 72, 73] and their role remains controversial. However one recent cRCT which emphasized partnership of TBAs with community health workers and links with the formal health system yielded promising reductions in stillbirth and neonatal mortality . Early recognition of obstetric complications, including obstructed labor, and higher referral rates for emergency obstetric care were observed in this trial, and would presumably be associated with reductions in intrapartum-related injury. 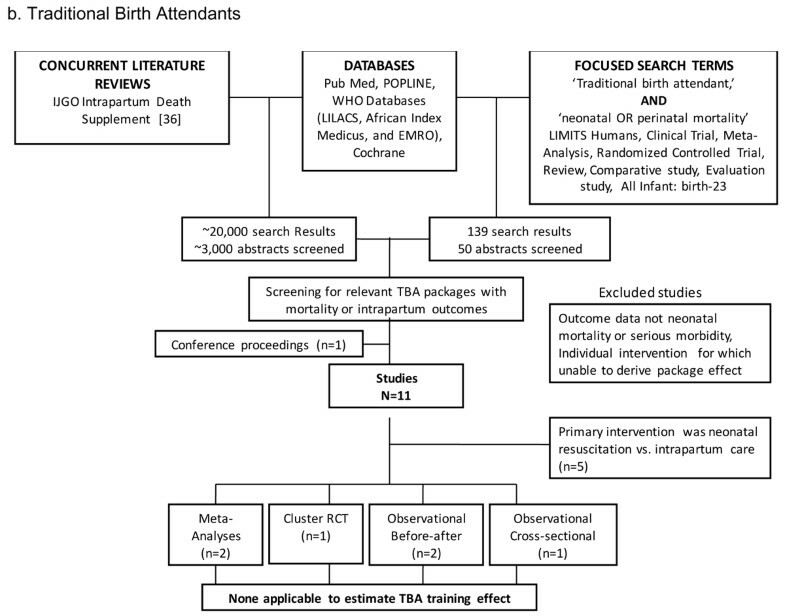 Several other studies have evaluated the impact of TBA training on obstetric danger sign recognition and referral [66, 74] ; a meta-analysis reported a small, positive association between training and TBA referral-maternal health service utilization . Given that the skills, role and training of the TBA may vary widely between regions and communities, and that the quality of evidence regarding training effectiveness is low and heterogeneous, the GRADE recommendation for implementation is presently conditional  and we did not attempt to estimate the effect size. However, the potential for TBAs to integrate and partner with the formal health system is promising, and requires further evaluation at scale and in varying contexts. During the 1990s, the coverage of skilled birth attendance in Sub-Saharan Africa and South Asia increased little, but recent years have seen increases in a few countries. A contributor to the increasing coverage has included demand-side financing (eg voucher schemes or conditional cash transfers in India [75, 76]), eliminating user fees (eg Ghana  and South Africa ) and the introduction of health insurance schemes (eg, Mauritania ), as reviewed recently . Furthermore, innovative strategies to increase the supply of obstetric care have emerged, including task-shifting and the use of non-physician clinicians . In Mozambique, assistant medical officers (técnicos de cirurgia) perform Caesarean section with no difference in complications or mortality rates compared to obstetricians [81, 82]. Training of non-physician clinicians has been prioritized in Ethiopia, Malawi, Zambia and Mozambique, in order to fill the human resource gap. In South Asia, task shifting has involved training general practitioners, nurses and medical officers in obstetrics and anesthesia to expand coverage of EmOC . Increasing the coverage of skilled obstetric care, particularly to reach the poorest, requires creative demand and supply side strategies, with sustained political and financial commitment by governments. No evidence available regarding effect of this specific package, even from observational designs. The potential for major mortality impact emphasizes the urgent need to invest in childbirth care, improving services for those already giving birth in facilities, and reaching the 60 million women giving birth outside facilities. Roles and impact of training other cadres, such as TBAs, to link mothers with obstetric care requires further evaluation. The lack of data, even descriptive studies, to assess the effectiveness of these UN recommended packages of childbirth care highlights the need for more evaluation. Programmatic planning is required to assess the impact and cost of various packages and implementation strategies in varying contexts, and to strategize how best to close equity gaps for rural, poor families and how to close quality gaps that cost the lives of many women and babies at birth. We thank the members of the Delphi Expert Consensus team (alphabetical order) J Belizan, S Bergstrom, S Bhutta, E Bocaletti, G Darmstadt, S Fawcus, R Goldenberg, J Hofmeyr, H Blencowe, J Lawn, AC Lee, M Mathai, N Moran, P Okong, R Pattinson, B Peterson, C Ronsmans, W Steinberg, G Theron, A Weeks, and S Zaidi. This work was supported by the Bill & Melinda Gates Foundation through a grant to US Fund for UNICEF for work on LiST and to Saving Newborn Lives programme of Save the Children. ACL, JL, GLD, RH undertook the searches and abstraction. ACL, SC, JL, GLD, and HB undertook the meta analyses. ACL, JL, HB, NM, SB and GLD organised the Delphi process. ACL and JL provided the initial draft of the paper and all authors contributed. All authors read and approved the final manuscript.